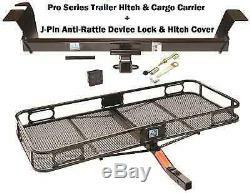 08-16 DODGE GRAND CARAVAN TRAILER TOW HITCH + CARGO BASKET CARRIER + SILENT PIN. 51203 / 63153 / 63201 / 7010. This Product Fits The Following Vehicles. 2008 - 2016 Chrysler, Town & Country, All Styles &###xA0;&###xA0; &###xA0; 2008 - 2016 Dodge, Grand Caravan, All Styles &###xA0;&###xA0; &###xA0;&###xA0;&###xA0; &###xA0; 2009 - 2012 Volkswagen, Routan, All Styles &###xA0; 2013 - 2014 Volkswagen, Routan, (Canada Only)&###xA0;&###xA0; &###xA0;&###xA0;&###xA0; 2012 - 2015 RAM, C/V Tradesman, All Styles. 2 Square Receiver Tube Opening. Rated up to 4,000 lbs. (GTW) Weight Carrying (WC) (400 Tongue). (GTW) Weight Distributing (WD) (400 Tongue). A-Coat Base w/ Black Powder Coat Finish. 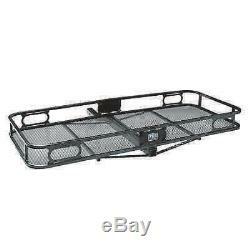 Cargo Carrier w/5-1/2" Side Rails, 24" x 60" Platform, 2" Sq. 5.5 side rails to retain cargo. Mesh floor for easy cleanup. Up to 60" x 24" (inside dimensions) cargo platform. More than just a hitch pin, J-Pin&###xAE; quickly and confidently secures ball mounts and other hitch-mounted accessories, eliminating the sway and rattle caused by part clearance issues. J-Pin&###xAE; ready receiver design allows for the most confident and secure hookup in today&###x2019;s towing market by compressing the hitch-mounted accessory against the inner side wall of the hitch receiver tube. Once attached, the hitch and towing components seem virtually welded together. 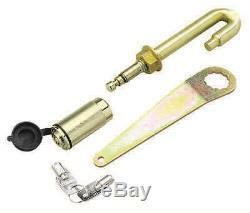 Packaged complete with its integral ball mount lock, J-Pin&###xAE; makes your towing system complete. 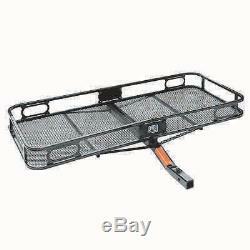 Ideal for bike racks and hitch-mounted cargo carriers. Requires hitch with additional 17/32&###x201D; hole in receiver tube. 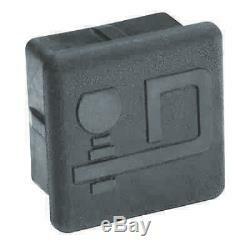 Convenient 1/4&###x201D; turn key for ease of use. Rubber construction tightly seals tube opening. Raised "D" Logo to distinguish the Draw-Tite brand. WE ALSO USE FED-EX GROUND INSTEAD OF US POSTAL SERVICE WHICH MANY OF OUR COMPETITORS USE. Any product you return must be in the same condition you received it and in the original packaging. DISCOUNT HITCH CENTRAL Questions or Comments? 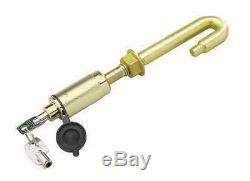 51203 / 63153 / 63201 / 7010 This Product Fits The Following Vehicles 2008 - 2016 Chrysler, Town & Country, All Styles 2008 - 2016 Dodge, Grand Caravan, All Styles 2009 - 2012 Volkswagen, Routan, All Styles 2013 - 2014 Volkswagen, Routan, (Canada Only) 2012 - 2015 RAM, C/V Tradesman, All Styles Product Picture Part Number Product Description Installation Instructions 51203 Pro Series Pro Series 51 Receiver ---2 Square Receiver Tube Opening ---Rated up to 4,000 lbs. (GTW) Weight Carrying (WC) (400 Tongue) ---Rated up to 4,000 lbs. (GTW) Weight Distributing (WD) (400 Tongue) ---A-Coat Base w/ Black Powder Coat Finish 63153 Pro Series Cargo Carrier w/5-1/2" Side Rails, 24" x 60" Platform, 2" Sq. Receiver Mount, Bolt Together ---5.5 side rails to retain cargo ---Mesh floor for easy cleanup ---Up to 500 lb. Capacity ---Up to 60" x 24" (inside dimensions) cargo platform 63201 Tow-Ready More than just a hitch pin, J-Pin® quickly and confidently secures ball mounts and other hitch-mounted accessories, eliminating the sway and rattle caused by part clearance issues. J-Pin® ready receiver design allows for the most confident and secure hookup in today’s towing market by compressing the hitch-mounted accessory against the inner side wall of the hitch receiver tube. Packaged complete with its integral ball mount lock, J-Pin® makes your towing system complete. The item "08-16 DODGE GRAND CARAVAN TRAILER TOW HITCH + CARGO BASKET CARRIER + SILENT PIN" is in sale since Thursday, December 18, 2014.